Use 1 level teaspoon for every 40–80 L (10–20 US gallons) once or twice a month (or as necessary to maintain a pH of 7.0.) 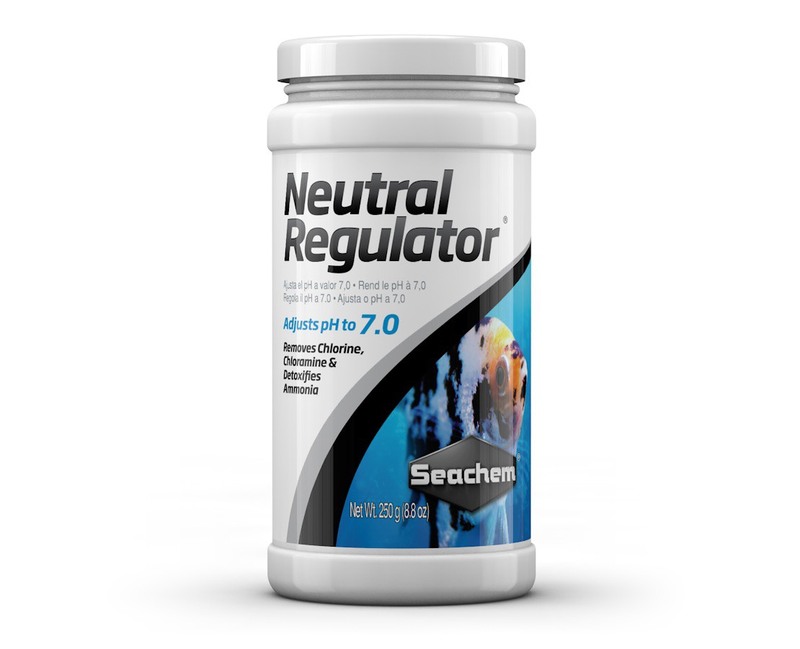 Neutral Regulator® may be be initially used daily in cases of high alkalinity until 7.0 is established. It may be added directly to the aquarium at any time. Ideally, it should be used when adding or changing water by dissolving in the replacement water. For precise dosing, use the Seachem Digital Spoon Scale. Contains phosphate buffers and conditioning agents. Safe for all freshwater fish acclimated to neutral pH. Q: What is the difference between Neutral Regulator, Discus Buffer, Alkaline Buffer, and Acid Buffer? A: Neutral Regulator and Discus Buffer are phosphate based buffers providing a very strong and stable buffering system. Alkaline Buffer and Acid Buffer are non-phosphate buffers, which although less stable than a phosphate buffer, are ideal for the planted aquarium where high phosphate levels would lead to an algae problem. Q: I see that Neutral Regulator contains phosphate based compounds as the buffering agent, won't this lead to increased algae growth? A: That depends on the type of light and intensity of light. Typical freshwater aquarium lights designed for fish only or plastic plant tanks are mostly low intensity and heavy in the red spectrum (to enhance reds in fish) and do not support either plant or algae growth effectively. 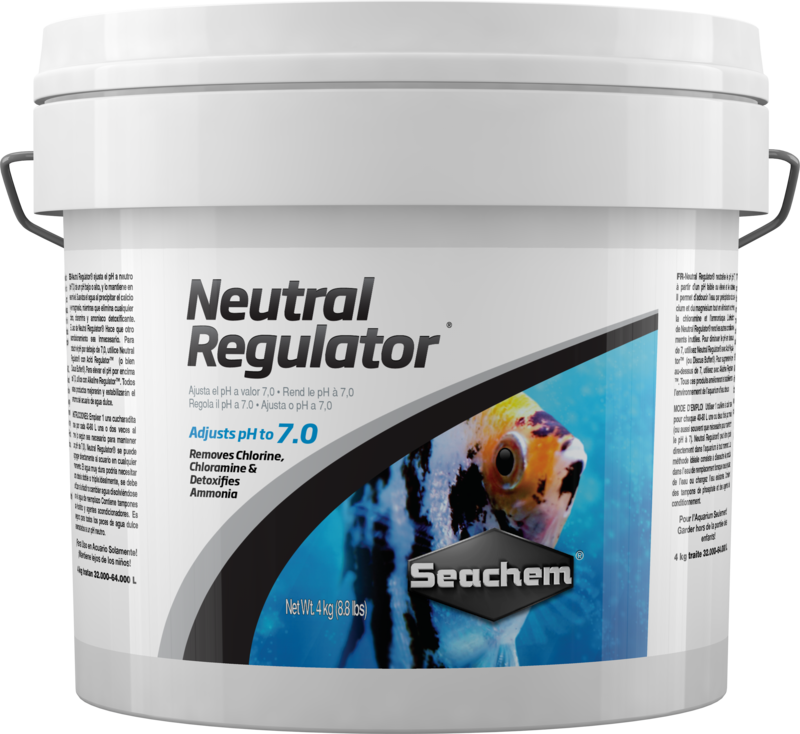 Neutral Regulator has been in wide use in freshwater tanks for at least 18 years with virtually no complaints of algae growth. That does not mean it cannot happen. Other factors being present, such as high nitrate, high organics, exposure to sunlight or other strong sources of light, the added presence of phosphate will be another contributing factor. However, even with no measurable phosphate, if the other factors are present, algae growth will take place. Algae problems do not arise from a single contributing factor. The operative word is "contributing. Q: I tried to use Neutral Regulator to adjust pH to 7.0, but it failed to do so. What am I doing wrong? A: There are two different buffering systems you can rely on in freshwater aquariums. The first is a bicarbonate based buffering system and the second is a phosphate based buffering system. Of the two, phosphate based buffers, like Neutral Regulator, tend to be more stable. In situations where a bicarbonate buffering system is strong, you will need to increase the dosage of Neutral Regulator until the phosphate based buffer can overcome the bicarbonate based buffering system. You can dose Neutral Regulator daily until you reach your desired pH. If you want a faster working solution (I'm assuming your pH is too high), you can use our Acid Buffer to dissolve some of your bicarbonate based buffering system to make things easier for Neutral Regulator to work. Q: I have added double the amount required and the pH is still around 7.8, all that seems to be happening is that the water gets cloudy. A: Your water must be very hard (high KH) so you will need to get the KH down to a level where the Neutral Regulator can control the pH. Right now the Neutral Regulator is fighting a losing battle with the high KH. Use Discus Buffer or Acid Buffer to bring the pH down... it will go back up again after a day or so, but add again. Eventually you will get to a point where the pH will take longer and longer to rise again... when that happens use Neutral Regulator to lock in the pH at 7-7.2. Or use an alkalinity test kit, when it gets down to around 1 KH so you can use Neutral Regulator to lock in the pH. Q: I am currently trying to reduce my pH and hardness so I can add Discus to my aquarium. I've ordered Discus Buffer and Neutral Regulator. How much of each should I use in an 80 gallon aquarium? Also, how effective are your buffers in softening my hard water? A: Neutral Regulator and Discus Buffer are extremely effective at bring your pH down and softening your water. You will initially see cloudiness as the buffers work to soften your water by precipitating out excess calcium and magnesium but should dissipate from your system. Neutral Regulator and Discus Buffer can be used in combination to achieve a desired pH when performing water changes or adding top off water. The ratio chart on the back of the label is designed for r/o water where there is generally no buffering capacity. Since you are using tap water, a little testing will be needed to establish the exact ratios to bring you pH down to 6.8 . Example: in r/o water you would use 1 part Discus Buffer to 1 part Neutral Regulator for a pH of 6.8 but in tap water, since there is already a buffering capacity present, you may need to use 2 parts Discus Buffer to 1 part Neutral Regulator to achieve a pH of 6.8. As for bringing down the pH in your existing system, you can use 1 level teaspoon of Discus Buffer (7 g) for every 40 L (10 gallons) daily until intended pH is reached. Neutral Regulator can be used to increase the pH, if needed. Please let me know if you have any further questions. Q: Is Neutral Regulator approved for use in a freshwater planted aquarium? A: While some people do use Neutral Regulator in freshwater planted aquariums with fine results, we recommend using a carbonate based buffer like Acid Buffer and Alkaline Buffer in a planted tank rather than a phosphate based buffer like Neutral Regulator. Phosphate based buffers are very stable and work well for stabilizing the pH for fish, but can cause issues in a planted tank. Q: I need to increase my KH to hold my pH steady. Will Neutral or Alkaline Regulator increase my KH to hold my pH steady? A: Neutral Regulator and Alkaline Regulator are phosphate based buffers and will not increase your KH. To increase KH, you will need to use Alkaline Buffer, which is a carbonate based buffer.